My grandfather, David Wolff, traded in wallpaper so he traveled a lot. This way he met his future wife Binchen Weinberg in the German town of Neustadt-Gödens. They married and came to live in the house where they ran the business, as was common in those days. It was a beautiful house: a monumental place, three stories high with the front door between two windows. Behind that door was a large hallway with floor tiles in two colours. To the left was a large counter where clients could admire the wallpaper patterns. Behind it was a rack where the rolls of paper were stored, with a curtain in front of it, so that one could not see them. My grandfather also had a warehouse in Kruisstraat. Behind the shop were a kitchen and a dining room and the stairs to the first floor. Behind the house was a small back yard where there was also a flight of stairs leading to the first floor, to my grandfather’s office. He was a silent man and I think I have never heard him talk. In the yard there were two loos, with barrels that were collected once a week and replaced by empty ones and a piss place that was tarred every now and then. When I think of Meppel, I still smell the tar. On the first floor there was also the living room overlooking the Hoofdstraat. Four busybodies gave them a good view of what went on in the street in front of their house. On this floor was also their bedroom with the most ghastly wallpaper with roses on it. They had four children: Jozeph, Rebecca, Sam and Sofie. My aunt Sofie never married and stayed with my grandparents. She attended the Rijks HBS (state grammar school) in Meppel. A photo shows her standing together with other pupils in front of the monumental front door of the school. Another picture shows her and some other girls in front of the gym. There is also a picture of her on the Tivoli tennis court. Jozeph married Frederika Langeveld and went to live in Parklaan; he followed in his father’s footsteps and went into the business. Sam married Betsy Frenkel and moved to England. Rebecca, my mother, married Mau Muller and moved to Utrecht. She was one of the first girls in Drenthe to finish a university education to become a doctor. Unfortunately, she never put it into practice. Of course there were servant-girls in the house (Vrouwtje and Katrina) and a shop assistant, who took mess tins with food to my aunt Amalia Weinberg, my grandmother’s sister, who lived above a greengrocer’s every day. In the thirties the turnover got worse and the premises on Hoofdstraat were sold. Grandfather had died in 1930 and grandmother Binchen and aunty Sofie moved to Utrecht, where they went to live in Magdalenastraat. Jozeph was the only Wolff to remain in Meppel to run the business. David and Frederika Wolff and their children Joop and Titia on the beach. 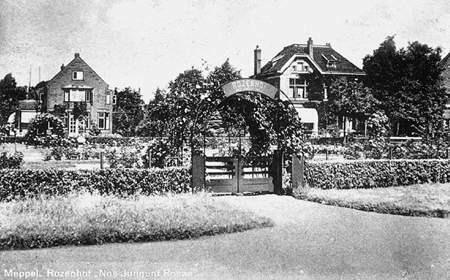 The Wolff family lived at 22 Parklaan, now called Wilhelminapark. 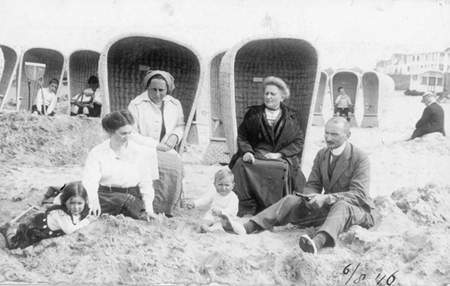 Mrs. Wolff’s father, Mr. P.Langeveld, had had a holiday home built at Noordwijk, for which the Wolff children laid the first stone. The family enjoyed many a carefree summer holiday here together with children and friends. The house is still there, completely enclosed by hotels and flats, still holding out. Mr. Wolff was the director of the more than a century old firm of Wolff & Sons, wholesaler’s in wall paper; not to be confused with the firm of M.D. Wolff, also a wallpaper firm. In the depression years the firm had already received a heavy blow and things got worse during the war. WWII was a difficult time for the family. Like the firms owned by ‘full Jews’, Mr. Wolff’s business was placed under legal restraint, which meant that from 4 August 1942 onwards Omnia in the person of Richard Bekker took over the management. Doing business had probably been made impossible earlier on. On 18 February 1943 the firm was liquidated. In the meantime there was already a person interested in their house. Early 1942 Becker received a letter from Mr. Schulte, who lived opposite the Wolff family in Wilhelminapark, asking permission to buy the house. Becket advised him to apply to ANBO with this request, because the house was private property. Mrs. Wolff had also problems. From early 1941 local councils were no longer allowed to grant subsidies to associations that had Jewish committee members. Mrs. Wolff was like Mr. C.H. van Es, who was Jewish by birth, a member of the board of the ‘Vereeniging voor Kindervoeding/Kleeding’ (providing food and clothes for needy children). Mr. Van Es took the honourable way out and resigned. At first Mrs. Wolff stayed on. She had read medicine and was an intrepid advocate of those who were suffering. She knew very well that without her influence the gifts destined for the needy children, would be sent to Germany straightaway, where they would be registered as a gift from the Dutch people. \Mrs. Frederika Wolff-Langeveld lost her function as a member of the board because she was the wife of a Jew. The times were very hard for the Wolff family. Mr. Wolff himself was granted exemption from transport, but he had to wear the Star of David. They had to register that they had a mixed marriage and Mrs. Wolff had to prove she had no Jewish blood in her veins. Danger was not over yet, however. Just before the end of the war Mr. Wolff received a summons, but this was never carried out. They were also notified at the end of the war that they had to leave their house, as it was claimed for the NSDAP. Temporarily they lived at 1a Leonard Springerlaan. Their house was occupied by the Germans from 28 November 1944 until 13 April 1945. They got a small compensation: fl. 58.33 a month. After the war they remained in their home in Wilhelminapark. Jozeph died in 1969, his wife in 1971. The Wolff family’s house on the edge of Wilhelminapark.